I recently had an interesting email from my epal Andy. It speaks for itself but I think it’s worth a read because it confirms the value of weedless soft plastics for bass fishing – given the right conditions. It’s of particular significance because Andy fishes where the tides are a bit bigger than here in Dorset (where are they not???) so it shows that it’s not just a peculiarity of our tiny double tides. Been reading your fantastic diary, I hope your back's not too bad (It’s not better yet. To be honest sitting at the computer like this isn't the best cure for it. ML). I can sympathise with you on that one, I tore the lowest disc in my back a couple of years ago which put me out proper. Still have to be careful now. Anyway enough of my problems! I just wanted to thank you for posting your diary. It has taught me a number of tactics. 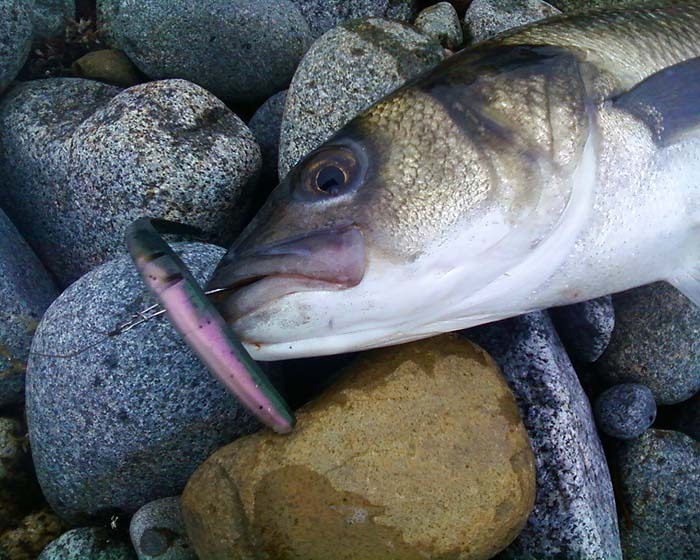 I'm so jealous when I read that you frequently see bass in the shallows (as your pictures show). I've been bassing for a few years now and I've never seen it.......until today that is. I moved to a bay and whilst fishing off a finger of rocks I noticed a big pile of weed being gently rocked by the sea on the beach. Gulls were steadily picking off the 'hoppers' from the weed and a cormorant was busy in the shallows in the vicinity of the weed. Remembering your diary and your comments about fish in and around the weed I made my way over to it. First off, I cast out my ‘Tacklehouse Feed Shallow’ lure. I think it's a fantastic lure and has produced many fish for me. I quickly realised the weed was an issue so I opted for a weightless Slug-Go. Then I saw it!! I couldn't believe it!! I actually saw a swirl not three feet off the shore. Then I saw it again and this time the swirl had a fish in the middle of it! I quickly wound in the slug-go and made a tactical cast. I was in amongst the swirls and I didn't do anything to the slug-go, I just left it in the tide and weed and it got smashed by a fish. (So, it was moving pretty slowly or not at all!! 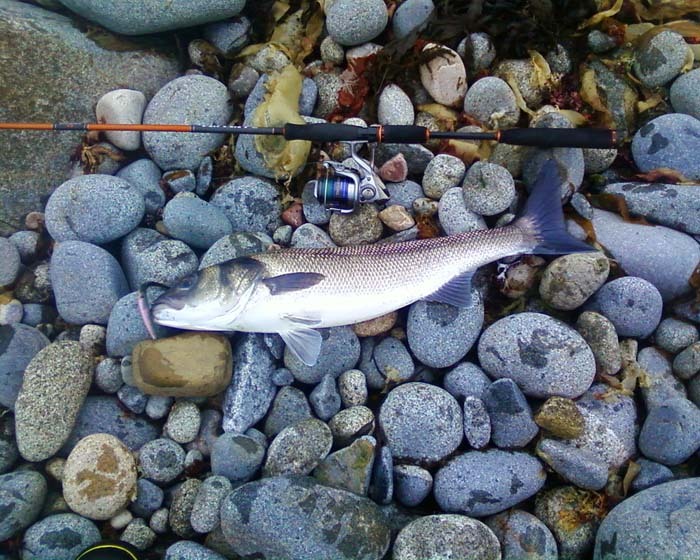 ML) The usual tussle ensued and I slipped a healthy 5lb 10oz onto the stones which went back to fight another day. I didn't have any other takes. Now I know that you must have done this yourself many times before (Not as often as I would like!! ML) but it is the first time I have seen and done it. Although not my biggest on a lure (7lbs 3oz – again on a Slug-Go) I think this is the best bass I've caught to date in terms of circumstances, knowledge and craft. Thank you for sharing your experiences. I wouldn't have had that fish if it wasn't for your diary. On a separate note, I had the pleasure of fishing with Alan (Vaughan) a while ago, unfortunately it was a bit early in the season and we failed miserably. If you're ever in my neck of the woods and want to 'have a chuck', feel free to tap me up and we can go out. There’s a couple of nice pictures to go with Andy’s report. He says he’s going to have another go while the weedy conditions persist so I await the results with interest. If it was me I expect the fish would have gone or would simply refuse to bite but hopefully he’ll have more luck.